Recently, the price of wooden airstones for aquariums seems to have gone from "overpriced" to "exorbitant". A 2-pack of Lee's 2" limewood airstones is about $6.50 at Pet Club, a discount local pet supply store. So, for nearly $7, you get two matchbox-sized pieces of wood with a pressed-in plastic air fitting -- parts cost is well under $0.10. Online, they are not much cheaper and are getting hard to find. The main use for wood airstones is to create micro bubbles in protein skimmers driven by air pumps, however current trends favor protein skimmers driven by a pump and venturi. I prefer the air-pump skimmers since they are quieter and work better for the size tank that I have (5 gallons). Most commercial wooden airstones are marked "lime wood". As near as I can tell, this is the same as "basswood". You'll find basswood at any specialty/hardwood store, and it's not expensive. I bought a 6"x48"x1" piece for a little over $10. This is enough wood to make over 100 airstones. 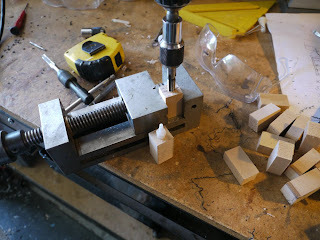 I cut a bunch of 2" sections with the grain of the wood transverse to the long side of each airstone. I then drilled a blind "letter R" sized hole into each piece, leaving about 3/8" of wood at the bottom. I tapped the hole with a standard 1/8" NPT tap, and threaded in a plastic 1/8" hose barb fitting. When it's time to change the airstone, the plastic fitting can be unscrewed from the old airstone, then screwed into the new airstone. It will last for a very long time.